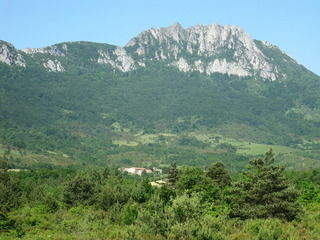 The 'Pic de Bugarach' peak with its 1231 m altitude is the culmination of the Corbières. 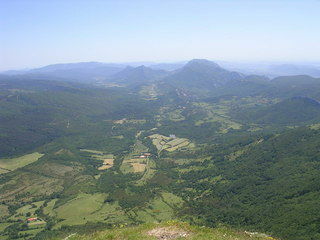 From it's summit you can see the Pyrenees to the south, the 'Montagne Noire' to the north, the Upper Aude Valley to the west and the Mediterranean to the east. It is also called the "inverted mountain" since due to a geological folding the oldest layers are located above the most recent layers. This is an isolated peak, not attached to other mountains forming a chain, and it can be seen from afar rising from the landscape. Maybe this is why there have always been legends about it. But in recent years they become increasingly bizarre, mixing fantasies of underground caves used by aliens to repair their UFOs, visits from outer space on the top, and the Mayan calendar predicting the end of the world December 21, 2012 (though the calendar is circular and does not predict the end of the world at all). 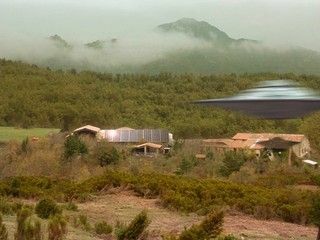 There are rumors on recent websites devoted to the peak, saying that someone met with witnesses having seen something unusual above the Bugarach peak, and this several times .... but no one is willing to talk about ... Sure, since maybe there is just nothing to tell! Meanwhile the Pic is waiting patiently for the after December 21, 2012. It doesn't need those rumors to invite you to come and admire it, its beauty alone is enough! Starting from La Bastide it takes two hours and a half to reach the top, and a little more if you really don't have the habit of walking, but in principle the climb is open to all! You can take a picnic lunch on the top, then after a contemplative siesta leisurely descend to the valley: a day that will recharge your energy batteries!